Syria is no different from many countries across the Arab world engulfed this year in unprecedented protests. But getting in to tell this story has been far more difficult. Reporting restrictions means there have been few journalists here to witness this story firsthand. A rare official permission to enter means we can now report from the ground, albeit with a government minder at our side on the streets. The roads of Damascus are still choked with traffic. The ancient old city, with its maze of narrow alleys, hasn’t lost its charm or bustle. Syrians still throng the cobbled streets in the covered markets, browsing in stalls selling everything from fashionable head scarves to the latest fashion in tight-fitting sequined jeans. But beneath the surface, this is clearly a city on edge, with a people worried about an uncertain future. Business is bad. Most factories are only paying about 65% of the salaries and have had to lay off employees. “We’re suffering and we know its going to get worse and worse before it ends,” said one of Syria’s top business executives who, like most people, would only speak off the record. There are almost no tourists in what was once a choice destination for travellers. Some owners of the delightful boutique hotels opened in recent years told us they may be forced to close. “I am worried about the days that are coming, worried about business, money, our life here. I hope it will be fixed soon,” said one shopkeeper who approached us in the old city. Another man standing next to an array of burlap sacks brimming with Syrian nuts and dried fruit, turned on us, shouting that the foreign news channels were lying. “You are not telling the truth about Syria. Everyone loves the president. Twenty-three million people love him.” he said angrily. Asked about the growing protests, in cities and towns outside Damascus, he conceded maybe “10,000 don’t like him”. He used the phrase used by the government that the protesters are mostly “armed gangs”. In a country where it’s never been easy to ask Syrians about politics in public, the only people who wanted to speak openly were those who expressed what seemed to be genuine support for their 46-year-old president. Bashar al-Assad took over from his father Hafez al-Assad on his death in 2000. But it’s impossible to know what people really think in the midst of such tension. One man who insisted there were “no problems” quickly changed his tune once the government minder was out of earshot. “I can’t tell you what I really think,” he whispered furtively. 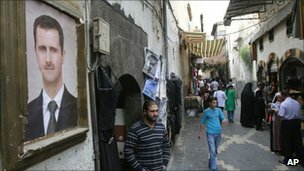 There is no visible security presence in the centre of Damascus, but plainclothes police are known to be everywhere. We begin to spot a few familiar faces. Syria’s immediate harsh response to protests, including the revival of a militia deployed during protests in the 1980s, has blocked protesters here from capturing a strategic square in the heart of the city. 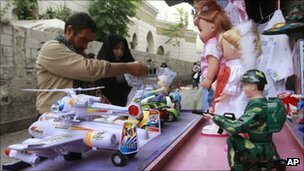 But there have been growing protests, and violent clashes, including targeted killings, in some of the suburbs. There have also been brave acts of defiance closer to the centre, but even the occasional bold unfurling of a flag or banner has been suppressed within moments. In one glass-fronted shop, we see a new selection of Bashar al-Assad memorabilia alongside the shiny posters of him which have always been ubiquitous. Now there are key chains, and ceramic plates and stickers with “I love Bashar” and “Proud to be Syrian”. The naufara coffee shop, lying in the shadow of the grand Ummayad mosque, is still packed night and day with Damascenes drinking sweet dark coffee and smoking the popular water tobacco. The city’s only traditional storyteller still holds court, recounting epic Arab tales of ancient conflicts and heroes of old. “All Syrians are one family and we have a good future,” effused storyteller Shadi Rashid al-Khallah when I asked him about Syria’s current story. But it’s a story that’s still being written and is still hard to tell.